Samuel L. Jackson recently spoke with IESB and had something very interesting to say regarding his screen time in Iron Man 2. It appears that Jon Favreau has talked with the star and has told him that his role of Nick Fury will be far more defined in Iron Man 2. I guess that means we wont just see him after the credits, hopefully! Jackson also said that he is looking forward to working with his newest cast member Don Cheadle. This seems like good news for two reasons. 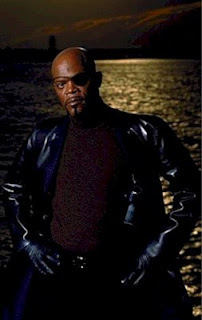 One Jackson was badass as Nick Fury and really be better suited having a larger role in Iron Man's universe. Secondly, Fury should be a integral part of creating the Avengers, which Iron Man 2 should lead in to. I am glad to see that Fav's is keeping everyone up to speed on the development, which means he and Theroux should be moving along at a good speed in development.